What does the Brexit vote mean for the NHS? If we let it, 'post-truth politics' will kill our NHS. The British public has voted and Britain is to leave the EU. Just as in previous elections, the NHS was heavily invoked by both sides. So where do we go from here? Chancellor George Osborne – who’ll presumably stay alongside Cameron til the autumn to ‘steady the ship’, as Cameron put it - has already told us that in the event of a ‘leave’ vote, he’ll be delivering an emergency austerity budget, with a further £15bn of cuts to public spending on health, education and defence. Leading economists predict another major recession with trade losses quite possibly leaving such a hole that even those cuts (along with £15bn of tax rises) won't plug it. No-one’s talking of an NHS ‘ringfence’, this time. The threat of further cuts - to the point where the NHS is no longer even trying to be a universal, comprehensive, quality, timely, publicly funded service - has just become substantially more real. The NHS is already facing record waiting times. It’s already reeling from the £20bn of cuts instigated under the last NHS chief executive, David Nicholson, and the further £22bn cuts imposed by the current one, Simon Stevens. Already local areas are drawing up ‘Sustainability and Transformation Plans’ (STPs) this summer to deliver Stevens’ cuts. As Justin Madders MP has pointed out, these STPs seem to be designed to evade democratic accountability. Campaigners fear local bosses are quietly dusting off plans to close and downscale local services across the country, and withdraw a wide range of treatments, from hearing aids to hip ops, from the NHS. So that’s where we were at before the Brexit vote. On Friday, as the result sank in, the Health Service Journal suggested that “the massive political distraction will give the Treasury – with its concern about financial stability redoubled– room to screw down even harder than it was already planning” and that these already terrifying cuts “will be toughened up, rather than be abandoned”. 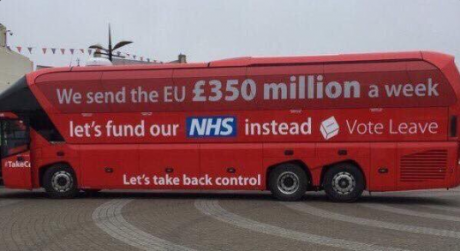 Of course, pro-Brexit NHS campaigners promised us there’d be a £350 million a week of money freed up by leaving the EU, that ‘could’ be spent on the NHS. Just three problems with that. Firstly, the figure is completely wrong, as just about everyone including the UK’s statistic regulator has pointed out. The true raw figure is probably around half that. Secondly, it's eaten up by the widely predicted trade losses. And lastly, as Farage admitted within hours of winning the vote, this central promise of more NHS funds was actually a ‘mistake’, and one that we can expect leading Brexiteers Gove and Johnson to do everything they can to wriggle out of. Gove was one of those also claiming that by drawing up the drawbridge and refusing access and/or healthcare to migrants, we’d save the NHS a fortune. The fact that migrants are propping up the NHS both as workers (55,000 of them from the EU) and as (largely healthy and young) taxpayers was merely an inconvenient truth to be glossed over. In fact, NHS leaders are alarmed at the prospect of EU healthcare professionals feeling so unwelcome (and with the value of the pound in their capped pay packet declining) that they have enough and go home, even as Cameron and co wrangle over the deals and details of who will ultimately have to leave. Sir Bruce Keogh, the NHS’s medical director, said on Friday “If you are a European doctor or nurse you might not feel too welcome at the moment” and stressed the need to keep them from leaving. The vote for Brexit is likely to be felt as a blow by other already demoralised health staff, too. Protections against health staff working long hours are in jeopardy. According to the Health Services Journal, the EU Working Time Directive will cease to apply unless Britain remains in some form of internal market – leaving staff exposed unless trade unions can manage to negotiate similar protections. Politically, we face an emboldened Tory hard right wing. Michael Gove was one of the co-authors of an infamous book which said the NHS was ‘no longer relevant for the 21st century’ and called for it to be replaced by a system of personal health budgets. Boris Johnson has told us that “if people have to pay for NHS services, they will value them more”. The fact that successive governments have sought to ignore the evidence that commercialisation just results in a more expensive and inefficient way of providing healthcare shows that post-truth politics is not, in fact, all that new. We have “had enough of experts”, according to Gove. So instead of ‘experts’ we have a panel of unelected Lords spending the next crisis-fuelled year deciding whether the NHS is ‘sustainable’ at all, no doubt calling many experts from the political class that has been whispering for a while that ‘we [whoever 'we' is] can’t afford it’. If we really want a victory for democracy, or one in the eye for the establishment, we need to start fighting now. For one thing, the left desperately need to reclaim the narrative of ‘waste’ from the right. The bureaucratic and financial cost of commercialising the NHS needs stripping away. It’s a cost that completely dwarves so-called ‘healthcare tourism’. Labour risks being too distracted by its own internal leadership squabbles to offer an effective defence. Many of their MPs have failed to notice that the electorate’s loss of trust goes deeper than any one issue. They queue up to admit ‘mistakes’ on immigration, but too many of them refuse to admit their mistakes in pouring billions of NHS cash into private sector hands for a string of expensive failures. Yet again it is the Scots – who may yet wave England goodbye – who have shown the most common sense on the NHS, having undone most of the commercialised, market mess, got their costs down and their satisfaction ratings up – and without running into any problems with the EU, incidentally. One lesson progressive campaigners need to take from the Brexit vote needs to be that throwing round arguments about mind-boggling sums of money, whether or not a vague concept of ‘the NHS’ is invoked alongside it, doesn’t seem to serve the left well. Indeed there’s a danger that – with the public already deeply worried about the future of the NHS – if NHS campaigns are reduced to soundbite calls for simply ‘more money’, this can feed a sense of a competition for scarce resources – a narrative the right is only too willing to exploit. So the conversation the left also needs to be having with the public is - what kind of society do we want to be? We are after all still the 6th richest country in the world. So we do have choices. As Professor Allyson Pollock told OurNHS on Friday, we now have an opportunity “to work out what we want instead of moaning about Europe”. In particular – do we want to look after each other? To care for each other, without fuss or favour, without profiteering vultures circling? Now is time for those of us sickened by Farage-ism to focus on what really makes us proud to be British. Polls show that the NHS tops that list. We need to re-frame the debate in terms of Bevan’s founding NHS principles – in other words, what it is about the NHS that we actually value. We need to demand our politicians commit to the rights of every man, woman and child in these isles to have the healthcare we need, when we need it, paid for in the fairest way, ie through taxation. And that public ownership is the most affordable and accountable way of providing this. The political waters are choppy. Labour may yet get its act together enough to push for a general election, and focus on meaningful pledges like defending people’s right to comprehensive healthcare. Equally optimistically, a new Tory leader could be forced to call an election within a year or so to try to secure a decent working majority, throwing out the timing for the major mid-election cuts that NHS boss Simon Stevens had been planning. And Jeremy Hunt – the longest serving health secretary in history – is widely expected to jump ship now, and may, it's whispered, even be nurturing leadership hopes of his own. But before we feel too cheered by that, we should remember that political elites have their own self-sustaining momentum. NHS boss Stevens has known Brexit duo Gove and Johnson since they were at Oxford together. Stevens has already shown his willingness to bend with the direction of travel, even if that direction is even more rightwards, more rapidly, than any of us anticipated. Even if it ends up hitting the over 60s who voted most strongly for Brexit, let alone future generations. Rather than holding out for the weasel words our elected politicians want to offer us, we need to start demanding better commitments of them. Over the summer, OurNHS has plans to help campaigners find new ways to cut through the weasel words and hold politicians to account on the NHS. Watch this space - and make sure you're on our mailing list to get our articles and updates.